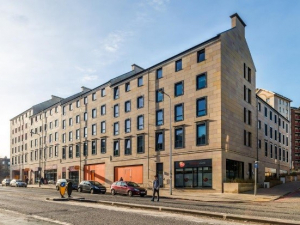 A new build state of the art student accommodation located on Leith Walk, Edinburgh. Shrubhill House has 259 bedrooms in a mixture of ‘cluster flats’ with ensuite bedrooms and studions including onsite laundry facilities including 5 No. Retail Units (which will be finished to shell stage only). All bedrooms are en-suite with private bathing facilities. There are a limited number of studios available with their own cooking facilities. Shrubhill is a new development so all facilities are fresh and modern with a contemporary design. The buildings are complete with traditional mechanical and electrical services, which consist of central gas fired boilers and CHP radiators and domestic hot water.